Now through February 28th, every full price ticket purchased online for any Dallas Stars home game in February will be eligible to receive 2 FREE kids tickets. 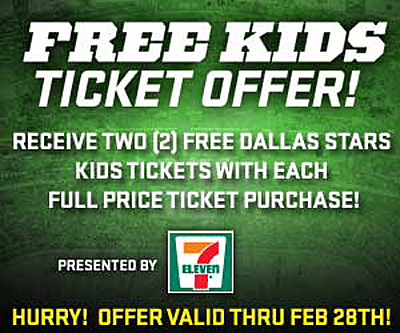 Visit DallasStars.com and click the “Kids Free” Ticket Offer for complete details. North Texas Kids is giving away 4 tickets to Thursday’s home game! ONE ENTRY: Leave a comment below and tell us who your favorite Dallas Stars player is. TWO ENTRIES: Do above AND share this blog post publicly on your Facebook page by clicking on the Facebook button below. THEN paste the post url of the shared post in your comment below. (Once you share the post, click on the time stamp to get the post url). Note, only publicly shared posts are visible to us and will be counted for this contest. My favorite player is Stephane Robidas, cause #3 is my lucky number!!! My favorite Dallas Stars Player is Jaromir Jagr. Richard Bachman is awesome and from the USA! The captain Brenden Morrow would be my favorite current player. Mikey Mo and Brett Hull are my all time favorites. My daughter has never been to a hockey game and wants to go so bad! I like all of the players! Micheal Ryder is my favorite player! 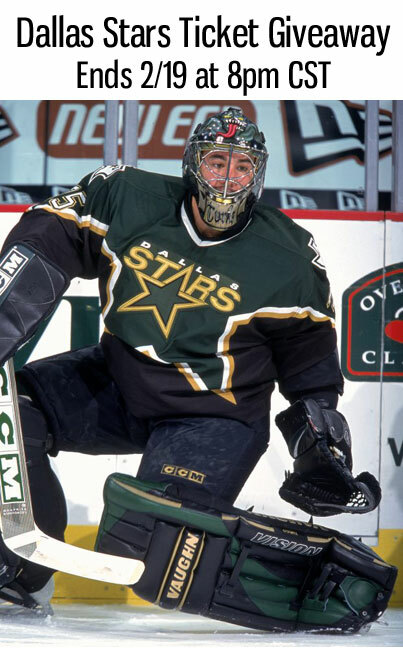 My favorite player always will be Modano! My favorite STARS hockey player is Brendan Morrow. My favorite Dallas Stars player is Richard Bachman! Cody Eakin is a family favorite. I also shared this giveaway on Twitter. Favorite Dallas stars is Brenden Morrow. I like all the players!!! Favorite player is Jamie Benn!!! I love Richard Bachman too!!!! Go Stars!!!! My favorite Stars player (if I have to pick just one) is Brenden Morrow. My favoirte player is Richard Bachman. Our favorite Star is Trevor Daley! His son plays soccer with us!! Thanks for participating everyone! Allentries posted by 8pm CST will be considered. WINNER ANNOUNCEMENT: Congratulations to Bill M for winning this giveaway! Thanks for participating everyone! Stay tuned for new giveaways coming your way.